In the sprawling Goulburn Valley, synonymous with great food, wine, waterways and weather, lies a motoring enthusiasts dream – the Shepparton Motor Museum & Collectables. At any given time, over 100 cars are housed within its walls from classic, vintage and veteran to motorbikes and memorabilia. Items are drawn from private collections, donations and restorers and the museum consistently has a variety of themed shows. The museum holds featured events throughout the year, the latest being its Annual Motor Show in February of this year which drew in phenomenal crowds. Last year, a lunch with Bathurst legends Alan Moffat, Fred Gibson, Bryan Thompson and John Mann was held. The museum is heavily involved with its surrounding community – obvious from its involvement in charity drives, a long list of sponsors and its growing popularity. Their association with past motoring legends and ability to gain unique and valuable vehicles make this museum a renowned destination and ultimate paradise for car enthusiasts. Lloyds Classic Car Auctions offer some of Australia’s rarest and most desirable collectable cars for sale. Having set several Australian records recently, Lloyds deliver staggering results in a unique simulcast format – proving that both the muscle and classic car markets are alive and booming. Some phenomenal cars that have gone under the hammer so far include a Rolls Royce Silver Cloud, A9X Torana’s, 66 Fastback Falcon, 1975 Chrysler New York, Bentley’s, Lamborghini’s, Corvette’s and Cobra’s. You can now buy and sell rarities such as these with full confidence in the transparent Lloyds auction model. A well-known 1978 Bedford “Mr Whippy” van that has called the Shepparton Motor Museum home for several years will be offered at auction. Before being purchased for the museum the van was driven as a fundraiser from Bundaberg to Geelong by Channel 7’s Sunrise Weather crew in 2014, raising funds for retired SAS soldiers, QLD farmers & Cancer research as part of ‘Tour de cure’. 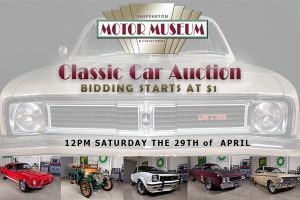 Our inaugural “Shepp Classic” auction event will be held on Saturday 29th April at the Shepparton Motor Museum just off the Goulburn Valley Highway. The event will include over 50 Classic Cars including a GT500 Shelby Mustang, 1911 Armstrong Whitworth, SLR 5000 Torana as well as Holden Monaros, a Torana Hatch and Ford Torino Talladega. Bidders are encouraged to inspect vehicles before the live broadcast commences and hammer drops at 12 noon on Saturday April 29th.